When looking to protect your business and employees, hollow metal fire-rated doors can often be the difference between a small inconvenience, and one that gets out of hand quickly. Not only are these doors extremely practical, in most cases they’re actually required. We’ve discussed how complicated and wide-ranging various building codes are previously, so we won’t re-hash them again here, but you’ll want to check your local building code for the exact requirements for your business. Building codes will not only require a door to be able to resist fire a specified number of minutes or hours, but they often require the hardware on the door to be self closing, and that there only be a single motion to open the door. You can contact us and we’ll help you go through any specific requirements you may have, but below you’ll find a good overview of the various options. What are Hollow Metal Fire-Rated Doors? Generally speaking, these are commercial doors for businesses and mutli-unit condos that are designed to resist fire for a specified amount of time. Our commercial fire-rated hollow metal doors with pressed steel frames are designed with various amounts of fire resistance depending on your needs. Fire rated doors are usually designed to stop fire for at least 20 minutes, and can usually be found in 20, 45, 60, 90 minute or 3 hour ratings. 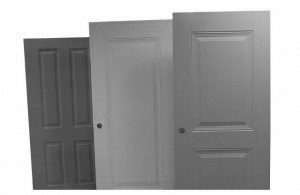 Although there are many fire-rated doors, hollow metal fire-rated doors are the only doors designed to control the spread of smoke and fire for up to 3 hours. 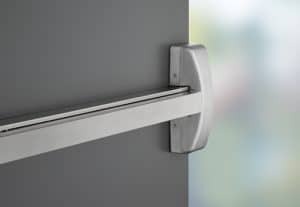 It’s more than just the door though, it’s also commercial door hardware – including locksets, door closers, exit devices, and hinges, some of which are required by code. We’ll also handle perimeter ceiling hardware like weather-stripping, thresholds, and door sweeps to make sure they meet requirements. Our doors can be built with egress and exit devices, like panic sets for example, to ensure smooth operation in case of an emergency. We also offer miscellaneous specialty hardware, like door viewers, so you can not only get the protection you want, but the features you need. Who Should Use Hollow Metal Fire-Rated Doors? The technical answer is anyone that’s required to by code. However the correct answer is anyone that is concerned about safety. Around 14% of people say that, in the event of a fire, they would not know what do to and would only follow the flow of people. A fire door allows for an easy exit, without allowing the fire to follow. Smoke inhalation is a major cause of death and injury in a fire. In fact, smoke is usually a greater threat to people than the fire itself. A fire door will also restrict the flow of smoke, giving you the time you need to escape. No one plans to have a fire, but it’s good to know that the protection is there when needed. If you have any questions about how hollow metal fire-rated doors can help you, drop by our showroom so we can assess your needs.